Can Hogan sustain his “I’m not involved” posture for the next six months, even with the media and public attention riveted on the presidential race? When it comes to skipping over controversial issues that might undermine his political fortunes, Maryland Gov. Larry Hogan, Jr. is a master of diversion. This technique has proved highly successful. He’s not about to let Donald Trump trip him up. You might call it the Hogan Side-Step. He used it successfully in running for governor two years ago, in dealing with a Democratic state legislature and now in avoiding a potential trap posed by Trump’s presidential success in Republican primaries. For many Marylanders, “stupid” and “Trump” are synonymous. By mixing and matching them in one sentence, Hogan gives the impression to Trump haters he’s with them. Yet what he’s really saying is that he’s keeping a mile-length distance between his political well-being and Trump’s candidacy. He can smell the toxic odors emanating from The Donald’s campaign. But can Hogan sustain his “I’m not involved” posture for the next six months, even with the media and public attention riveted on the presidential race? “tell it like it is” figure they adore? After all, he won 247,000 votes in Maryland’s GOP primary. How many of them are offended by Hogan’s lack of support for the Republican presidential nominee? The concern is that Trump backers might return Hogan’s ingratitude in kind by deserting him when the Republican governor runs for reelection in 2018. That’s the chance Hogan is taking. Democrats, meanwhile, have targeted Hogan’s avoidance as a weakness they can exploit. The Democratic Governors Association labeled Hogan as one of the “Silent 9” of GOP governors remaining mum on a Trump endorsement. That will be a constant refrain in Maryland by Democrats throughout this campaign. It won’t pressure Hogan, though, who knows there is extreme danger in supporting Trump in November. That’s what Democrats would love to see. The governor will have none of that. He’s not about to get tied to Trump’s call to deport 13 million illegal Hispanic immigrants, Trump’s call to jail women who have abortions or Trump’s crude and mean-spirited put-downs of women and anyone who dares criticize him. Hogan will simply sit on the sidelines pretending not to notice that the most important election in our lifetimes is taking place. It could be a tough balancing act. What does Hogan do about attending and voting at the Republican Convention in Cleveland? Does he cast his ballot for Trump then? How does he avoid that peril? Perhaps he will find himself too busy running the state to go to Cleveland. Hogan could be using Lt. Gov. Boyd Rutherford as a partial shield against attacks from Democrats. Rutherford has made it clear he’s anti-Trump. “I’m not going to endorse him,” the African-American lieutenant governor said. “He’s not my choice at all” – leaving open the question as to who Rutherford plans to vote for in November. In heavily Democratic Maryland, that’s a smart political position for Rutherford, who doesn’t have to face voters on his own as lieutenant governor. It’s Hogan who must worry about not angering Republican voters while at the same time not energizing Democrats by his tactical side-step. 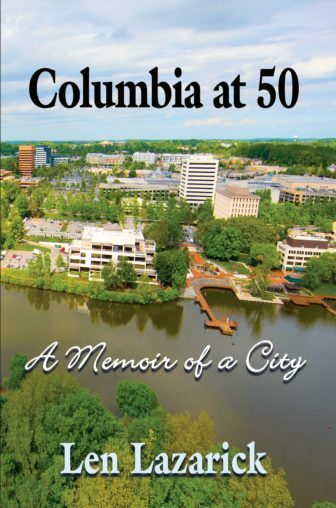 Rest assured Hogan will be campaigning this fall for other Republican candidates, especially those running for Congress and House Minority Whip Kathy Szeliga, who is running for the United States Senate. Szeliga is the real loser in Trump’s candidacy. The last thing she needs in November is a large Democratic turnout, which now seems assured, thanks to The Donald’s presence. The fear factor among Trump opponents will be a powerful incentive to get to the polls in record numbers. Then there’s this possibility: What if Hogan’s best political buddy, New Jersey Gov. Chris Christie, ends up as Trump’s choice for vice president? What will Hogan do then? He’d be in a personal bind. Hogan enthusiastically endorsed and then campaigned for Christie’s presidential bid, in part because Christie had given Hogan enormous emotional support when the governor took on his courageous fight against cancer. It might be excruciatingly difficult for Hogan to deny Christie if he becomes Trump’s choice for veep. Maryland Democrats would have a field day were that to take place. It would be bad news for Hogan’s efforts to distance himself from the presidential battlefield. Hogan needs to stay on course, avoiding incendiary social issues (like immigration, abortion rights, gay rights and gun rights) until after the 2018 election. 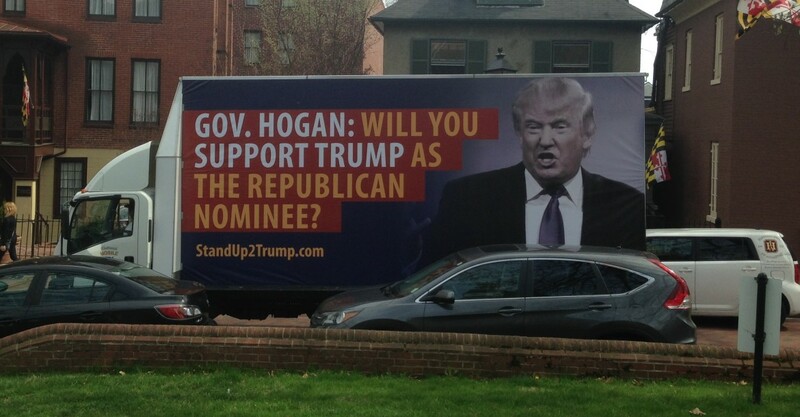 If Trump somehow drags the governor into the presidential campaign, Hogan’s re-election chances are harmed.